One choice can transform you – or it can destroy you. But every choice has consequences, and as unrest surges in the factions all around her, Tris Prior must continue trying to save those she loves – and herself – while grappling with haunting questions of grief and forgiveness, identity and loyalty, politics and love. 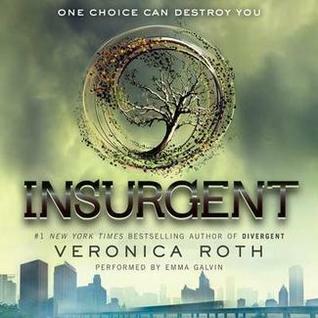 New York Times best-selling author Veronica Roth’s much-anticipated second book of the dystopian Divergent series is another intoxicating thrill ride of a story, rich with hallmark twists, heartbreaks, romance, and powerful insights about human nature. This book didn’t live up to the first but still had plenty of twists and turns to keep me interested. Had I not been listening to it there would likely have sections that I would have skim read over, but I doubt I would have given up completely. Tris’ lack of self-belief and overall self-loathing was irritating. I wanted her to be strong, especially as there were people who needed her to be. If this had been book one, I wouldn’t have picked up the second but seeing as I powered through, the cliff-hanger did convince me to finish the trilogy.